First of all, I am from Denmark, so please excuse me, for bad gramma and poor spelling. I hope one or some of you, can help me. 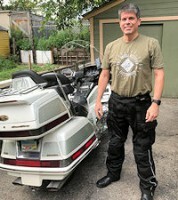 My 81 Goldwing (production year) struggles to turn the engine over, if I stop and tries to restart it after a few minuts, but only the first rev, after that initial rev it turns over as usual at starts right up. If I wait for about 30 minuts or more, after stopping, there are no problems. The Starter is 6 months old, and the problem has been there from the start. I have adjusted AFM and syncronised a year ago. Any ideas to explain this od problem. If you think it may be leaking gas into a cylinder causing the cold start problem try to turn the fuel lever to off when the bike is not running. If it does ok,the fuel shut-off valves in the carburetors may be leaking. Also..does this happen more often when the bike is on the side kickstand and starts better if left overnight on the centerstand? The thing is (I may have explained it poorly) the problem only occures, 5-10 minuttes after it is turned off.If I leave it for 30 minuttes or more, it will start right op. I always place i on the centerstand over night so I actually do not know, if placing it on the sidestand will change anything. Please let me know, if my answer makes no sence. It struggles when it is warm. Cold start, with choke, it turns over perfectly, at fires right up. Question.When it's warm and you try to start it..does the "struggle to start" mean that it turns the engine over much slower than when it's cold? Or does it turn over the same speed but does not start well? The first rev or so is much slower, and as soon its past the first one, it turns over like always, at fires right up. Check the voltage at the starter when cranking. If it goes lower than 10v it could simply be the battery is weak or the connections are bad. If it stays above 10v and still cranks slow the starter is probably defective. Also check and clean the ground cable connection behind the left upper engine mount. The starter is new, but that is no garanti for it to be fault free. The groundconnection was cleaned less than a year ago. I will try to messure the voltage, next time I come home from a run. I am just a bit confused, why it will turn over normally, right after it has been turned off, but not when 5-10 minuttes has passed. This will kill the spark. It is possible the ignition advance mechanism is sticking..This would fire the cylinder too far before top dead center and cause the engine to have difficulty turning over by the starter. When cold,the spark is set at 10° BTDC. The mechanical advance moves it to (up to) 23° BTDC..if it sticks there it fires the cylinder too early causing it to almost stop turning over..Then it releases and moves back to 10° BTDC and it turns normal..
My best guess and easy to test. It do not sound like it ignites before it struggles. 8 volts is much too low..Was that measured directly at the battery posts? Is the acid level in the battery full or low? Also check the battery voltage when the bike is run for 10 minutes at 3000 rpm. It should not be more than 14.5 volts. Over charging a battery is bad. No, I measured between battery ground and the terminal on the starter. If I measure directly on the battery (when it does not struggle) it drops to 10'ish volt. I had a chinaone in stock, but I had to relocate some wires to make it work. Ok.it does sound like the battery is in poor condition.It is still important that you check the charging volts.. Batteries do not last long if under charged or over charged. The rectifier is handbuild. We used to have an electromechanic here inDenmark, called Erik Schnabel. He designed his own rectifier, and used a new principle. The rectifier do not short the stator, but opens the circuit instead. That insures that the stator and rectifier do not overheat. wich should make them last longer. When Erik died, the patent was sold, and the buyer improved the design, at these days it is called DiscSchnabel rectifiers. 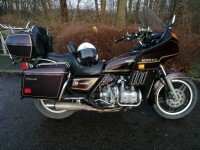 There is a model for most japanese and british motorcycles. That is a great design.Better than original.Sometimes engineers can get stuck on one method and not think outside the box for other solutions. Exactly. And many aftermarket parts are poor copies of the originals. I have contacted the store, were I bought the battery, after explaining the problem, they asked my to return the battery, and they will test it, and see if I should have a refund or a new battery. 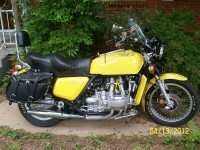 Just send it this morning, so no joyrides on the goldwing until it is resolved. So did you get a result? Is the battery the culprit? My home test indicated that the battery was bad, so i send it back, it was still covered by the waranty. A battery was sendt to me the day before yesterday, but with no message of the sellers action on this warantyclaim. I will not know anything, before the battery arrives. I will try to remember to give you an update.